News outlets are reporting that at least 11 [see updates below] people were killed near the Tree of Life Synagogue in the Squirrel Hill neighborhood of Pittsburgh during Saturday morning Shabbat services. Many more were reportedly injured. The suspect, who is now in custody, is believed to be a white male armed with an AR-15 and multiple handguns. 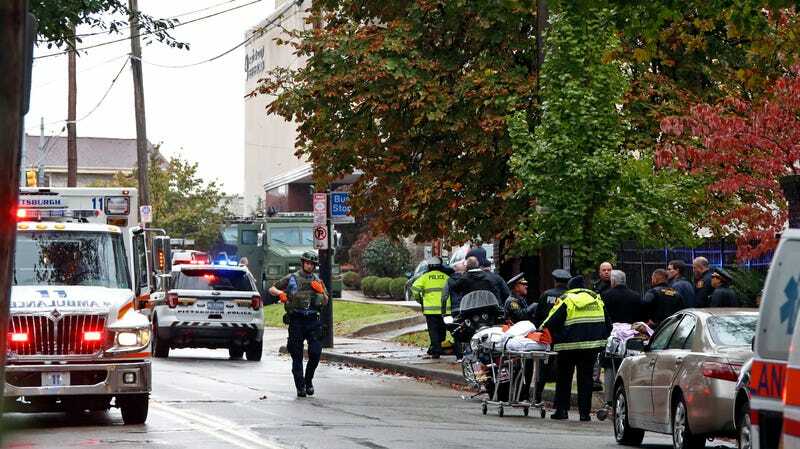 According to local CBS affiliate KDKA (via the Guardian), the suspect had walked in yelling “all Jews must die.” People barricaded themselves inside the synagogue and made calls to local law enforcement, who reportedly exchanged gunfire with the suspect on the third floor. Two police officers were shot before they were able to negotiate and take the suspect into custody. A bris ceremony had been scheduled for this morning. “It’s a terrible, terrible thing that’s happening in our country with hate,” Trump told reporters at Joint Base Andrews this morning. When a reporter asked whether we need to revisit gun laws, Trump answered immediately: “Well again this has little to do with it, if you take a look if they had protections inside the results would have been far better.” He later clarified that “protection” referred to an armed guard, and that lawmakers should focus on expanding the death penalty rather than regulating gun control. KDKA has ongoing live coverage. This post will be updated with further developments. The Pittsburgh Public Safety Department has asked media to stop calling public safety phones in order to conserve battery power. UPDATE 1:05 pm: Police are reportedly preemptively securing several synagogues in New York City. UPDATE 1:15 pm: In a press conference, Pittsburgh Public Safety Director Wendell Hissrich emotionally stated that this is one of the most “horrific” crime scenes he’s ever seen. He asks that anyone with information regarding the investigation call the FBI at 412-432-4400. A victims’ assistance and reunification center is being set up at 106 Berry Street. He says that there is no longer an active threat and asks that people who are not investigators or first responders stay away from the area. Hissrich says that this will be a federal investigation and treated as a hate crime. UPDATE 1:40 pm: KDKA reports that the suspect and four law enforcement officers were injured. The number of fatalities have yet to be confirmed by federal investigators. Several people are currently in surgery, according to KDKA reporters. Update 3:30 pm: Chief of staff for Pittsburgh City Councilman Corey O’Connor has reported that ten people have died. According to CNN, Bowers is 46, not 48, as previously reported. Update 5:00 pm: Pittsburgh Public Safety Director Wendell Hissrich has confirmed that the death toll has risen to 11. Update 6:00 pm: Trump has confirmed plans to go ahead with a campaign rally this evening.